Anton Korobov (Ukrainian: Антон Коробов; born 25 June 1985 in Mezhdurechensk, Kemerovo Oblast) is a Ukrainian chess grandmaster (2003), two-time Ukrainian champion and the 2013 European Blitz Chess Champion. He was voted the best male chess player of Ukraine of 2012. Korobov graduated from University of Kharkiv. 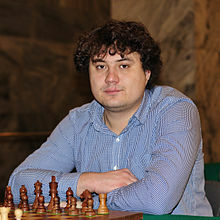 Korobov won the Ukrainian Chess Championship in 2000 and 2012, and finished second behind Andrei Volokitin in 2004. He won the Masters tournament of the Abu Dhabi Chess Festival in 2010. In 2011, he came first in the Nakhchivan Open. He competed in the Chess World Cup 2011, where was eliminated in the second round by Nikita Vitiugov. In February 2012, he tied for 1st-3rd with Mateusz Bartel and Pavel Eljanov in the 11th Aeroflot Open. Korobov took clear third place in the Ukrainian Championship of 2013, behind Yuriy Kryvoruchko and Ruslan Ponomariov respectively. In the World Cup 2013 in Tromsø, Norway he eliminated Vasif Durarbayli, Baadur Jobava, Daniil Dubov and Hikaru Nakamura, but in the fifth round he was knocked out by former World Chess Champion Vladimir Kramnik, after losing the first game and drawing the second. He served as Anna Ushenina's second during the Women's World Chess Championship 2012 and during her match with Hou Yifan in the Women's World Chess Championship 2013 alongside Alexander Khalifman. Korobov won the individual gold medal for his board 2 performance at the 2013 World Team Chess Championship, contributing to team bronze. In 2014 he competed in the 41st Chess Olympiad held in Tromsø, scoring 4.5/7. In September 2015 he took part in the Chess World Cup 2015, where he was eliminated in the second round by Dmitry Andreikin, after knocking out Dragan Šolak in round one. In the following month, Korobov won the 16th Poikovsky Karpov round-robin tournament on tiebreak over Victor Bologan, after they both finished on 6/9.